So how did we get to the point where Ruthean swings are dismissed at best and mocked at worst? How did we regress into a nation of forceless swings? Although it wasn’t planned, let’s take a deeper look at how we could have systematically dismantled the American Baseball Swing. 1970s: Convince baseball bat manufactures Worth and Easton to introduce one piece aluminum bats to the baseball world. The aluminum bat industry will explode upon the youth baseball market and revolutionize how the youth game in America was played. 1974-2000s: Introduce aluminum bats to college baseball. Offensive statistics will spike. Runs per game, home runs, batting average – all will take off in the following decades as the aluminum bat technology will increase exponentially. Millions will watch 12 year olds blast baseballs 200+ feet every summer at the Little League World Series and Rosenblatt Stadium in Omaha will become home to the aluminum bat fueled home run derby that will be college baseball**. The introduction and advancement of aluminum bats was revolutionary to the sport. Stylistically, it changed how the game was played and socially, it changed how the game was perceived. Moreover, it changed the American baseball swing. Unlike a wood bat, the metal bat displayed a trampoline effect and a much larger sweet spot. Consequently, metal bat manufacturers could make their bats lighter and still impart more force on a baseball. Players would no longer have to use big/forward movements – as seen in the Ruth clips – or effectively maximize angular and linear velocities as well as gravitational and reactionary forces. No longer did youth baseball players have to rely on efficient muscular movement patterns and proper sequencing. They could simply rely on the trampoline effect of the advanced technology to do the work for them. Bigger players could simply slap home runs out of the park. Paradoxically, the more efficient the metal bats became – the less efficient the mechanics of the swing had to be. 1) Metal bats, simultaneously, the source of hitting prowess and our greatest weakness. The metal bat revolution helped mask flawed mechanics as successful hitting became a byproduct of the advances in bat technology rather than advances in mechanics. And because kids mature at different rates, bigger kids were the true beneficiaries of the technological advancement. They were the ones who would make the All-Star team, get extra reps, and ultimately model what everyone thought the swing should be. They were hitting home runs, so the swing they were utilizing must be efficient. Smaller players were then instructed to swing the same way. Players, parents, coaches – all fooled by the increase in technology. 2) Because the metal bats concealed flawed mechanics, players were never given true feedback of their swings. How can a player who hit a home run ever think their mechanics were flawed? It won’t be until the player is old enough to compete at the highest levels that the swing will be exposed for what it is – inefficient. But by then, it will be too late. **In 2011, the NCAA ended the party by introducing the BBCOR protocol – which limited the trampoline effect and the size of the “sweet spot” of the metal bats. Home runs, runs scored, and batting averages all plummeted. Inefficient fundamentals that were masked by advanced technology were left exposed. Unfortunately, American baseball had built up 40 years of swing philosophies predicated on an advanced piece of equipment that featured a large sweet spot and a trampoline effect. Post WWII America: Refocus “competition” from an activity in which all parties can learn and grow to an activity in which there is a “winner” and a “loser.” Televise the Little League World Series, implement performance programs that celebrate winners, and denounce “losing” as un-American instead of a learning opportunity. Success in the game of baseball is inverted. The ways to win games at the youth level are markedly different than the ways to win at the elite level. Due to field conditions, field size, and athletic ability – hitting groundballs are far more valuable at the youth level than at the elite levels. Further, putting the ball in play is exponentially more valuable at the youth level than at the college/MLB level. Combine this with the trampoline effect of metal bats, and putting the ball in play at the Youth Level is a necessity to “win.” It follows then, at the youth levels, putting the ball in play – and on the ground – are regarded as the highest levels of competency because they are positively correlated with winning. Parents and coaches enter tournament after tournament with the goal to win. The more focus on winning, the more focus on doing things that win rather than doing things that will make baseball hitters successful as they progress. Focusing on winning leads people to celebrate results (despite inefficiencies) rather than the process. It leads to meaningless games, meaningless trophies, and always an inflated self-perception. 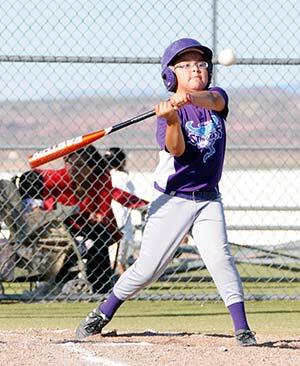 In youth baseball, a kid with 4 weakly hit ground-balls can register four hits and help his team win. Due to field sizes and the technology, a player can hit home runs with a significantly flawed swing. Players, coaches, and parents will receive false signals that they were successful – because success is defined as winning. Because everyone is focused on winning – errors, swinging bunts, inefficient hits are all cheered. Further, the youth player will not change his/her swing because all the signals provided scream “success.” Parents and coaches will continue pushing kids to meaningless games – which have zero growth value due to minimum reps – and celebrate the “success” of their youth players. However, as defensive players become more adept, range and arm strength improves, simply swinging to put the ball in play – and on the ground – becomes less valuable. Those same 4 weakly hit ground-balls become outs. The bunt in the video above is caught. Players who used to be “good” are now getting exposed. Players and parents are left thinking what happened? Further, at the American youth level, throwing strikes at the cost of throwing hard is valued. So many youth pitchers never develop the proper mechanics to maximize force. Consequently, American youth hitters rarely see truly adept pitching until they reach elite levels. But by then, their flawed mechanics are no match for the force and deftness of their pitching opposites. 1990s-2000s: Place emphasis on hitting and pitching instruction in “lesson” format. 1 on 1 sessions will hammer home the obsession of short term gains. Focus on the short term – coupled with advances in bat technology – will severely impair long term growth. MLB salaries began to explode in parallel with the advancement of metal bat technology. In 1970, the MLB average salary was $44,000 – with Willie Mays taking home a league leading $135,000. By comparison, according to the National Center for Education Statistics, the average salary of a teacher in 1970 was $9,570. 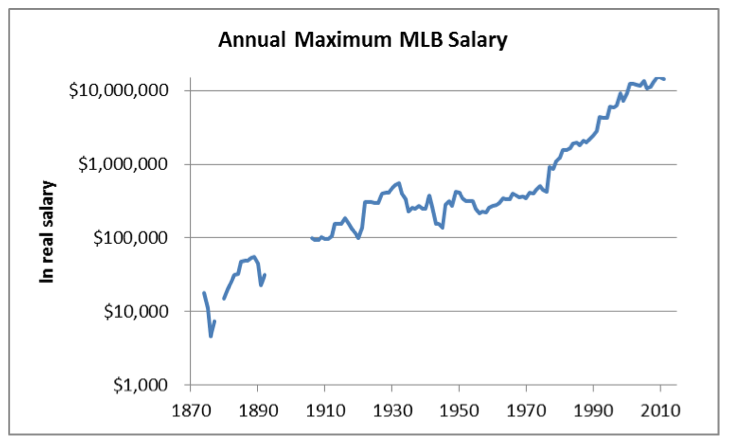 Then, with the introduction of free agency and advances in television – MLB salaries exploded. 1) Lessons. Professionals saw an economic opportunity to provide “lessons.” Lessons were structured in an assembly line format – hitters or pitchers received a 30 minute or 1 hour “lesson.” As arbitrary as the number is, it enabled instructors to shuffle athletes in and out. Economically, it was a home run. Developmentally, it was the beginning of the end. In a lesson format, focus is on short term gains rather than long term development. How could the focus be on the long term with the progressive cost structure of lessons – we paid now, we want gains now! Further, in a sport like baseball, many times short term gains come at the cost of long term growth. For example, because striking out is viewed as the worst outcome in youth baseball, making contact became the underlying goal of every lesson. Unfortunately, “making contact” at the youth level places focus on mechanics that do not translate at the elite levels. Coupled with the advances in technology, hitting instruction became focused solely on utilizing the advanced equipment to produce results (see above “winning”). “Throw the hands,” “Drive the knob,” “Stay short” were all industry created jargon that focused on utilizing the bigger sweet spots and trampoline effects of the metal bat so players could simply put the ball in play and take advantage of weak fielders and short fields. Intuitively, parents will keep paying money for lessons if their son/daughter is seeing “results” – it doesn’t matter if the results happen to be fueled by advances in technology rather than fundamental movement improvements. Ultimately, the “industry” handcuffed the learning process as it impeded our fundamental learning blocks: accountability, socio-behavioral skills, psycho-analysis skills. We no longer had the opportunity to take unlimited reps, we no longer had the opportunity to receive immediate performance feedback, and we no longer had the opportunity to implement our own movement changes. We have now introduced technology that will mask inefficient swings. Players will never get proper feedback because you can’t tell if the success is because of proper mechanics, earlier physical development than peers, or because of advanced technology. We will focus on winning, so producing results that don’t translate to success at elite levels (ground-balls, weak contact, 220 foot popups) will be celebrated. We will then focus on limiting reps and accountability by systemizing the industry. This way, we can universally espouse our flawed swing concepts that are hidden because of the advances of technology and the way the game is viewed at the youth level. The philosophy behind our program is centered around our student athletes developing borderline barbaric swings by blending science and technology with the mental aspects of introspection and reflection and the intent of mashing baseballs. Our programs are designed to combat inefficient and ineffective “practices,” “lessons” and the obscene amount of meaningless non-productive games that our kids are being subjected to. We push our student-athletes to focus on long-term growth with the byproduct being successful scholastic careers, college offers, playing at the next level and most importantly developing skills that transcend the athletic arena. As humans, we are inherently limited by our desire for short term gains, immediate gratification, and quick fixes. We are handcuffed by our own shortsightedness and our inability to plan for the long term. Unfortunately, our short term focus is founded in our biology; and this does not square well with a growth intensive sport such as baseball. Moreover, technological advances help mask mechanical inefficiencies in youth baseball. These inefficiencies are then exposed when the technological aids are removed. Athletes that receive immediate performance feedback at younger levels can make internal mechanical fixes that, over time, have propelled them past their technologically aided peers. The hits and bombs by 8/9 year olds in the Mako composite Era has made the problems even worse! Hopefully the new bat rules effective 2018 which basically is a new bat type that “mirrors” performance of a wood bat. My cynicism says it may be a ploy by the bat manufacturers to sell a whole lot of bats! One of the best blogs yet. I as a parent did and saw things exactly as you said. Since bringing Logan to Compete I feel he has grown as a player in ways he never would have but more than that he has learned how to work with other players to correct his own swing mistakes. The input of “Steve Johnson” has proven to be very valuable but he has worked with other player in the organization who are as much about improving each other as they are about improving themselves. This is a great concept that I feel works for the benefit of all the player who workout at compete and I am glad we have the opportunity to be a part of it. Excellent article and perspective on the game! Absolutely a great post and a great read. I’ve been following you guys on Instagram for quite a while and I love how this post embodies embracing the process rather than the results. Makes me want to make my players swing nothing but wood. Great stuff, keep it coming!